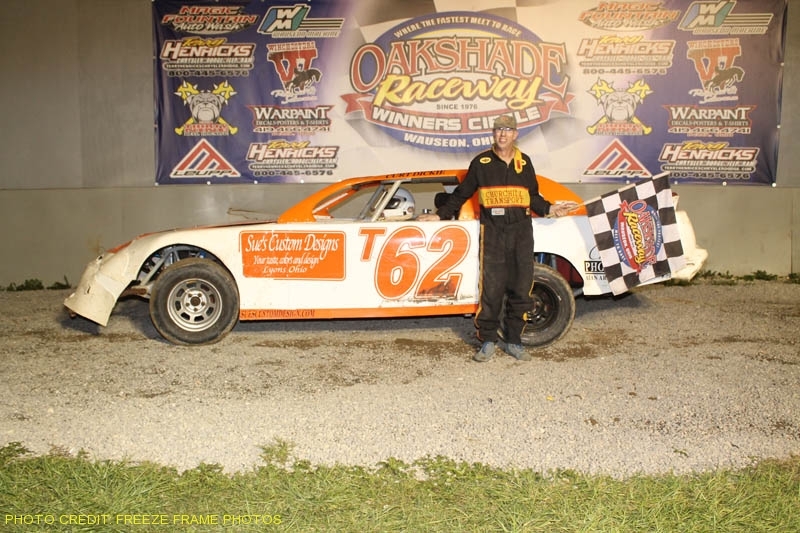 A 37-car, 250 lap Enduro race capped off the 2011 racing season at Oakshade Raceway on Sunday afternoon with Dan Dippman overcoming set backs to win the $2,000 victory. Rob Liaeff took the lead out of the gate and led the first portion of the race until he got caught up in an accident before lap 50. Shawn Stamm took command of the race after Liaeff’s troubles and led until just past the halfway point of the race when he made a trip to the pits. Brad Gilbert then inherited the lead for a short while until he too had to pit. It was Brian Plotts turn to lead a few laps shortly before the 200 lap mark until Stamm reasserted himself as the leader. Both Stamm and Plotts couldn’t make the entire distance and pulled out of competition in the last 25 laps. Dan Dippman worked his way to the front after being scored 33rd on lap 25. A flat tire forced him to the pits late in the race with under 25 to go. Steve Dickman then became the leader and had a lap and a half lead over Dippman by the time he exited the pits. Dickman seemed to be maintaining his advantage but was involved in a big wreck in turn three with less than 10 laps remaining that took him out of the race. Dippman continued on and regained the lead as Dickman could only sit in his car and watch. On the final lap, something became amiss with Dippman’s car. Dippman contemplated pulling in to the pits, but opted to stay out on the track one more lap which happened to be the 250th lap, earning him the victory in what was a grueling yet exciting Enduro race. Mark Henderson quietly worked his way into a second place finish followed by Chris Williams in third. Steve Dickman had accumulated enough laps to hold on to a fourth place finish with Chris Osborn ending up fifth. With racing season officially over, Oakshade Raceway will shift gears with the return of the Haunted Hay Rides on Friday and Saturday nights through the end of October starting on October 14th. Also, the annual Swap Meet is scheduled to take place at the track Saturday, October 15th starting at 9am. For more details, check out www.oakshaderaceway.com.